The bee pick up day will be Sat April 12. We have a lot of orders this year so we would like to distribute them in an orderly fashion. Please read the schedule. If you live over 100 miles away, come when you can. Everyone, please come within your scheduled time . Sticking to the schedule will help avoid long delays. If this doesn't fit your schedule please come after 3 pm until 7pm. There will no bee supplies sold on this day unless you have already preordered. I will have the bees sometime on Fri. April 11. If you are able to pick up on Friday please call me to arrange that. In about two weeks the packages will be shaken. One thing to remember is the bees in the package may not bee the same race as the queen that was ordered. In about 30 days after install, the change over to the queens race should be almost complete. Why does this happen? Carniolan bees do not move up very well to be shaken. Most of the bees in the packages are Italians. I am sold out of Bees for 2008. I will have Queens available after April 11. They will be available through May. I had a starved out colony.. I had a colony that died. Dead bees in a cluster heads stuck in the cells, butts looking at me. Classic starvation. They even had 4 frames of honey near the dead bees. I have to clean up the loose dead bees in the hive, clean off the bottom board. The new bees will clean up the rest. I will fill it up with a new package of bees. I want to save the honey to feed the new package, so I closed up all the entrances to keep the honey from getting robbed out. 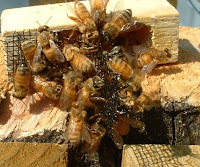 Queen rearing has been going on for two weeks now in California. The bloom of the almond trees is in full gear. Pollen is coming in in large quantities. The weather has been warm. 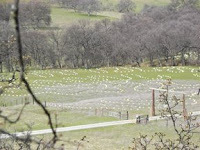 The drone rearing colonies are loaded with bees. All this adds up to great queen rearing conditions. I am thinking about feeding. I am getting ready to feed. I have some High Fructose Corn Syrup (HFCS) from last fall to use up. 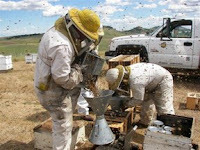 In the spring though it is important to give the bees fructose and sucrose. 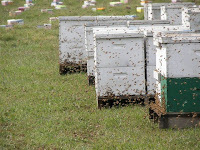 The hive will be building up and the bees need proper nutrition. 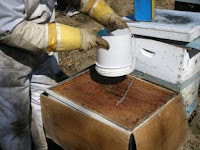 HFCS and 1:1 sugar water mixed together will provide the critical nutrition for proper bee development. This mixture is good for spring development. In the fall, straight HFCS will do. My package bees are almost gone. I have about 100 left. 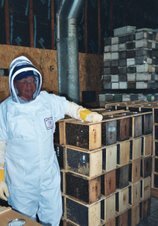 I have 100 reserved for the beekeepers short course. Any left after that will be available. I do have about 70 - 4 frame nuc's left.